W-w-w-wuh-we just haven’t got a c-c-c-aargh-huh! I hate the sound of sirens. The ghostly wail is actually the sound of air being pumped through a rotor, but there’s no way of boxing it off as practical mechanics when it pierces the everyday order of things and injects a note, or two notes, of alarm. In the case of the intro of Block Buster – also written as Blockbuster!, and Block Buster! – it warns of one of the most exciting glam rock singles of the era. I was seven when it was released in January 1973. The band’s classic line-up – Brian Connolly (vocals), Andy Scott (guitar), Steve Priest (bass), Mick Tucker (drums) – had been stomping around the pub/club circuits of Greater London and North Wales individually and in various configurations since the early 60s, playing R&B and bubblegum pop longer than I had been alive. In August 1970, they coalesced. And I started Abington Vale Primary School. Painlessly guided into Bacofoil jump suits and winched aboard heels to match the age and destined for greatness under the industrial songwriting aegis of Nicky Chinn and Mike Chapman and producer Phil Wainman, the lads were only heard vocally on the first Sweet records until their musicianship was recognised and they were allowed to take over from the session players and even write their own b-sides. What’s strange about The Sweet, and their sweet-smelling success, is that while glam-racket contemporaries Slade and Wizzard are still hailed as a national treasures, with Noddy Holder, Dave Hill and Roy Wood cast as bona fide Queen Mums, David Bowie is an immortal, and even Marc Bolan is an impish icon whose legend was sealed in arboreal tragedy, the Sweet seem to have slipped into a nostalgic vacuum where ridicule in snarky captions on Top of the Pops compilations is their legacy. This must be rectified. As a child on the edge of my first breakthrough, I favoured the Sweet and Slade equally, and held Alice Cooper and Gary Glitter in the same pin-up regard, but it was Steve Priest who captured my heart one Thursday night when Nan Mabel was round to hit her mark and ask me if the pancaked bassist was a man or a woman. (In truth, I wasn’t 100% certain myself, but it’s amazing how liberal you can be at seven because I knew that he was smashing.) I must have seen Little Willy and Wig-Wam Bam performed on the Pops before Blockbuster! summitted and remained at the toppermost for five weeks in the first months of ’73, but neither is stamped on my memory. I won’t have been philosophically and politically nuanced enough at that age to appreciate the proto-punk provocation of Priest wearing a Nazi uniform from the BBC costume department for one of the Blockbuster! recordings, but it helped to nail them to the post of posterity. Out of that siren comes the song: a percussive guitar signature into a trucker’s beat, with handclaps, a thumping bass, celestial harmonies (“Ah-ahhhhhh“), and a duality of rock’n’roll riffs, one acoustic, the other electric. Then, a warning. As if to confirm Chinn, Chapman and Wainman’s combined debt to Phil Spector, the bridge at two minutes is engorged by timpani. While there is a compartmental cleanliness to the arrangement of each element in this gold blend of perfect pop, it has definite dirt under its fingernails, the perfect blend of spotless and spotty for your blooming generation. The Sweet story ends sourly, with the decline of singer Brian Connolly after being beaten up, a cancelled support at the Who’s Charlton gig in ’74, an internal power struggle just as the band took control of their own songs and production, and the inevitable split in ’79. Andy Scott and Steve Priest both lead the inevitable dual incarnations of the Sweet (prosaically, Andy Scott’s Sweet and Steve Priest’s Sweet), with Connolly and Tucker no longer with us. If they’d only recorded Blockbuster!, their place in pop’s Valhalla would be assured. They got too much, they got too high. Blockbuster! was the first single I ever bought. I’m writing this in a coffee shop in the centre of Glasgow. Teenage Fanclub, like the Soup Dragons and BMX Bandits, formed in Belshill, a town ten miles south east of the centre of Glasgow. We are under a week away from the Scottish Referendum. Scotland, and in particular its most characteristic city, feels like a pretty vital place to be having a coffee and an opinion. We have established elsewhere what a vibrantly musical would-be republic Young Scotland is, and it was carrot-topped emeritus Alan McGee’s London-based but Greater Glasgow-spirited Creation who helped bring Teenage Fanclub to the wider audience they strove for and fully deserved in the early 90s, when “indie” was not yet a dirty word. British guitar music slowed down to an interminable crawl in the mid 2000s, the main drag caused by Coldplay but sluggishly adhered to by Snow Patrol, Travis, Embrace, Keane. Why didn’t they just call themselves Slow Patrol and be done with it? This era was turgid indeed. A go-slow does not automatically equate with grandeur or meaning – you have to be as assured as Elbow or Doves to crack that. I mention all this only because Teenage Fanclub, a decade earlier, had also eased off the pedal (if not the pedals) and created a glorious new groove for themselves that never plodded or trudged. Listen in particular to their third, fourth and fifth albums again – on which nary a foot is put wrong – and experience a band at the top of not just any game but a game they’d devised themselves. It’s not that literally every song is slow, but listen in wonder at how naturally they slip into that gear. What You Do To Me, Metal Baby, Sidewinder, Alcoholiday, Guiding Star, About You, Mellow Doubt, Don’t Look Back, Neil Jung, I Gotta Know, I know, I know, I’m just listing tracks now, but great tracks, and not one of them breaks a sweat. It’s as if the Fanclub recognised that Everything Flows was the key song on A Catholic Education and based a whole repertoire around its colours, just as Rothko had done with his crimsons and burgundies, and nobody asked for their money back. Four seconds of tasty feedback, then that first couplet: so evocative, so arch, so potent, like the opening lines of a hip, dog-eared novel. Let’s go over that again. Who’s she? What’s the significance of her choice of denim? That’s she’s cool? That she’s uncool? She’s promising to fill the Status Quo void in her record collection. Is that cool? She thinks they’re called “the Status Quo”, or perhaps she’s balancing the semantic karma after Mark Goodier’s habit of dropping the definite article from band names (Farm, Charlatans). She doesn’t even know the name of the band she thinks are cool enough to boast about thinking of investing in, but who may not be as cool as this denim-clad woman thinks they are. It’s Norman Blake singing his own lyrics here, but it might just as well not be, as Teenage Fanclub remain the most democratic songwriting unit ever registered. This instrument-swapping egalitarianism does them great credit, and stops Norman from being the frontman, even though he is. But what darkness is this? What fierce creature is she? Not the sad groupie hinted at by the later intelligence that “she likes the group ’cause we pull in the slack” and even drives them home “if there isn’t a bar”; compos mentis, it seems, and yet contraceptively covered. Our protagonist says, “I didn’t want to hurt you,” which suggests that he did hurt her. That’s gratitude for all the compliments about his hair she gave, the designated driver. There is some fine lyrical alchemy afoot here, and maybe that’s why the slow pace works: it gives you time to ruminate on what you’re hearing. “Slacker” was an imported lifestyle choice in the early 90s, matched by the often laboured nature of grunge and the thinness of its complaint. 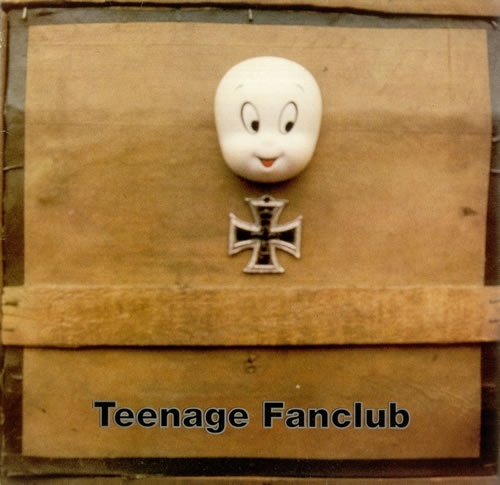 Teenage Fanclub “pull in the slack”. They are bright, breezy, self-mocking individuals. If ever a member disappeared, he was replaced by another just like him. Belshill seems to breed rare, fluting wits (the Soup Dragons’ Paul Quinn was an easy fit after the manic Brendan O’Hare left). Once you’ve met Norman and Gerry and Raymond, it’s impossible to unpick them from their music, but if you’ve encountered them live, you’ll feel you know them anyway. I was blessed to be in faraway Wick with the second line-up of Teenage Fanclub on the day of Princess Diana’s funeral, and while they treated her tragic passing with respect, I recall a natural optimism that seemed to bounce off them like positive ions as we breathed deep of the sea air outside the hotel. To pick out a couple of the niceties that raise this six-minute song up from merely super-tuneful, intelligent, timeless epic rock that you can listen to between meals without ruining your appetite: the simple contrast between the crackle of distortion and the sweetness of Norman’s vocal; the full-bodied depth on the “Oh yeah”s; the droll guitar “quotes” from Parfitt and Rossi before the second verse and the bridge; and the dramatic gap at the halfway mark, where everything stops flowing and Brendan almost falls across his kit to bring it back from the brink and the four of them harmonise like angels. Angels, I tell you. As if we deserve swooping, sawing strings as well. I finish writing this on the train back to London. When I cross the Scottish border, it may be the last time I do so without a passport in my jacket pocket, so I’d best mark this momentous occasion but putting The Concept back on, which is a pretty vital song about the status quo. Oh yeah. It’s hard to convey to the youth of today how vital Smash Hits was at the end of the 70s. In an age so pre-digital “sharing” meant literally lending things to other kids, we would pass copies of the fortnightly pop-words magazine around in the playground, eager to discover what our favourite bands of that post-punk/disco era were actually singing. Imagine it, young people of today! To care about what artists were singing! And to have no immediate method at our fingertips of finding out from one fortnight to the next! The lyrics to Up The Junction, the third smash hit from this glowering bunch of posers from a place called Deptford, appeared across a full page in “ver Hits” – as it was not yet self-mythologisingly known – and what an unusually lengthy and involved rearrangement of the English language it was: each verse a chapter in a story and no chorus, no repetition, no deviation or hesitation. Just a minute: thinking about it, their previous hit, the snarlier Cool For Cats (which I’d exchanged pocket money for), didn’t really have a chorus either beyond the line “co-oo-ool for cats”, and it too had beguiled my fragile teenage mind with its literate turns of phrase and its Sweeney imagery. Who were these clever blokes who looked like they were trying so hard to disguise their cleverness? In the mid-80s, by which time I’d gone off to art school in faraway London but retained my devotion to Smash Hits, my path almost crossed with that of Squeeze, when one of our visiting tutors at Chelsea School of Art (headquartered in Wandsworth, a borough I’d first heard about through Cool For Cats when London was a foreign field) made a head-turning request. 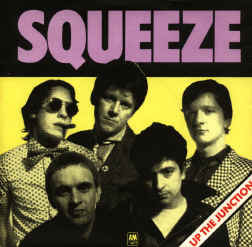 Could I write out the lyrics to the next Squeeze album, Cosi Fan Tutti Frutti? His name was Rob O’Connor, and he ran his own design company which specialised at that time in LP sleeves. Honestly, we with a pop sensibility worshipped at his self-effacing feet, especially when we discovered that it was his handwriting on the sleeve of the Banshees’ Kaleidoscope album. You should know that my handwriting was mannered and cartoony in 1984, hence the speculative calligraphic commission. In the event, my lyrics (and I really did write them all out, by hand) went unused. But it was close. And I got paid. You know sometimes when you have to just shut up and reproduce the lyric, like Smash Hits did in 1978? What audacious rhymes. What Davies-esque evocation of the capital via place names. It’s only at the bitter end – and bitterness takes that long to rise to the surface – that our South London protagonist admits he’s “up the junction”. The song’s title is also its punchline, its killing joke, its crowning glory. This is a London A-to-Z of emotion. Having almost skipped over this band’s virtuosity – a trait hugely unfashionable in the white heat of New Wave – I will throw a bone to seasoned pro Gilson Lavis, whose exactitude from the drum stool lent both weight and a lightness of touch often simultaneously to the many timeless hits of Squeeze. Such an asset. Maestro Jools Holland, an uncontainable personality who dipped in and out as his parallel broadcasting career flourished, was closest to Squeeze’s only other permanent member, and he and Lavis came together in the 90s and are still going strong in the Rhythm & Blues Orchestra. That’s two lasting relationships from one band of brothers. I find it’s easy to forget how good Squeeze were – that’s how good they were. But they were the equal as a British singles band to Madness, or the Kinks before them, or Blur after them. They were what a fortnightly pop-words magazine in the steam age was invented for.